As a member of the United States Green Building Council (USGBC), STAUF USA, LLC., offers products which architects, builders, specifiers and contractors use to qualify for LEED® points. Applicants are encouraged to complete the LEED application which can be found at www.usgbc.org and clicking on LEED Online. 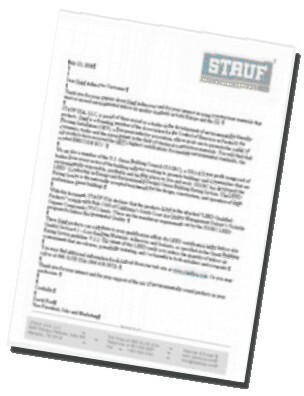 Click here to download a list of Stauf’s LEED approved products, as well as a statement of participation by Stauf in the LEED and USGBC programs.